Birmingham, Tuscaloosa and central Alabama Birmingham, Tuscaloosa and central Alabama U-Pick farms: Find a pick your own farm near you in Birmingham, Tuscaloosa and central Alabama for fruit, vegetables, pumpkins, organic foods,local produce and more! Looking for a local, pick-your-own farm in Birmingham, Tuscaloosa and central Alabama? Scroll down this page and you will see the U-Pick farms in Birmingham, Tuscaloosa and central Alabama, sorted by county. Those that offer organic or sustainably grown produce are identified by the words "organic" and/or "sustainable" in Green, next to their name (see "What does Organic mean?"). The U-pick crops they offer follow the name of the farm. To search the page for a specific crop, use Ctrl-F (or on an ipad or Mac, use their "search on this page" function) If they have a website, the name will be in blue and underlined; click on it and it will open their website. If you find anything outdated or inaccurate, see the customer and farmer menus (as appropriate) at the top menu bar to submit updates and corrections and help me keep each current! Click on the resources drop-down above, if you need a county map. Note: So many, many farms in Alabama have no internet presence, and they don't use email. It makes it exceedingly time consuming and difficult to make sure they are still open. If you have any updated information about any farms below, please let me know! Kenneth Witt Farm - Strawberries, cantaloupes, peaches, squash, cucumbers. 136 Co Rd 1518, Cullman, AL 35058. Phone: (256) 385-6772. Directions: 4 miles east of Holly Pond across Blount Co. line on left 1/4 mile west of 231-278 4-way stop sign at Rainbow Crossing on right. Follow signs. Open: April 20-June 1, Monday, Wednesday, Friday, 7:30 am to 5:30 pm. 306 Rainbow Drive, Anniston, AL 36207. Phone: 256 237 0054. Email: [email protected]. Open: We are here most all the time; Call if you wish; 256 237 0054. Directions: We are across from White Plains Elementary school at 306 Rainbow Drive which is the first house on the right. Click here for a map and directions. Payment: Cash, only. 67675 Hwy 49 N, Lineville, AL 36266. Phone: (256) 488-5818. Directions: Hwy 49 North. Approx. 7 miles north of Lineville on left-follow signs. Open: June 10 - August 15, Monday to Friday, 8 am to 5 p, Saturday 8 am to noon. 1504 Borrowed Acres Road, Goodwater, AL 35072. Phone: (256)245-8036. Email: [email protected]. Open: Does anyone have current information, are they still offering pick your own or are even open? If so, please write me, last reported hours were Monday to Friday 7 am to 11 am; Please send Email for dates. Directions: Click here for a map and directions. Payment: Cash, only. Comments from a visitor on May 03, 2012: "Norris Farm is operating this year. They are closed this week, but we have already been there to pick strawberries twice, and they are planning to re-open next week. Comments from a visitor on October 13, 2008: "Very nice and clean, Fun Corn Maze"
Comments from a visitor on July 10, 2011: "This place is great. The bushes were just full of blueberries. They provide buckets to pick with and bags to pour them in when you leave. It was so much fun taking our 2 year old granddaughter .She had a blast. We have a new tradition. " 6630 Quinton Road, Dora, AL. Phone: 205-674-7121. Alternate phone: 205-674-8424. Open: June to Aug., Monday to Saturday, 7 am to 7 p.m. Directions: Hwy 78 W to Graysville, Flat Top- West Jefferson exit. Stay on Flat Top Rd until you get to Snowville Brent Road, turn right. Turn left on Quinton Rd one quarter mile on left. Call for directions. Tim Tate Road, Dora, AL. Phone: 205-648-9301. Open: July 1 to August 31, 7 am to 7 p.m. Peaches. 1265 portland Street, Tarrant City, AL, 35217. Phone: 256-268-2638. 265 Tanyard Lane, Pell City, AL 35125. 3165 Carl Morgan Road, Moody, AL 35004. Phone: (205) 640-5971. Directions: Call for directions. Open: Daylight hours. 7818 Chandler Mountain Road, Steele, AL 35987. Phone: 1-256-538-8515. Open: August til frost on Monday to Saturday from 8am til dark. Directions: Call for directions. Payment: Cash, only. Comments from a visitor on August 24, 2011: "I loved the farm, and picking my oun tomatoes"
Comments from a visitor on June 10, 2010: "I have been picking blueberries here for the last 3 years and it is a wonderful place! The farm owners Mr. & Mrs. Wadsworth are delightful- so helpful. 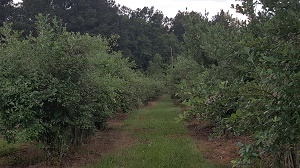 The farm is well kept, the bushes are easy to access, & their prices are better than most of the other near-by u-pic blueberry farms. I look forward to spending time in the blueberry fields at Wadsworth Blueberry Farm every year. It is one of my favorite summertime activities." 12000 Plowman Road, Gordo, AL 35466. Phone: 205-799-5273. Alternate Phone: 205-799-1277. Fax: 205-752-9536. Email: [email protected]. Open: Be darned sure to call before you go - I haven't seen an update from this farm in years. Directions: From Northport civic center go west on highway 82 to mile marker "32". Proceed and take the next left onto Lee Bonner Road. Go 1/8th mile to 4-way stop. Proceed straight onto Church Road. Cross over wooden trestle bridge and past church on left. Turn right onto Plowman Road. Proceed a little over one mile. Look for mail box on left. Gate entrance to farm will be directly on your right. Click here for a map and directions. Payment: Cash, only. A visitor writes on June 25, 2018: ""
Near Birmingham , strawberries are usually ready for picking in mid-April.